Alisha VanderWoude started as the soil conservationist in Allamakee County on October 29, 2018. Originally from Michigan, Alisha came to Iowa to attend Upper Iowa University where she majored in Environmental Science and Conservation Management. During her time at Upper Iowa, she interned with the NRCS offices in Clayton, Muscatine and Fayette Counties. When she graduated in May of 2017, she became the Soil Conservationist for Butler County. She currently lives in Elgin with her boyfriend and their dog. Alisha is excited to see what Allamakee County has to offer and get to know the wonderful people. The staff of the Allamakee SWCD/NRCS office are glad to have her here. 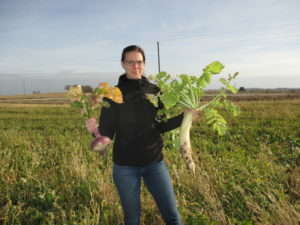 Alisha is very interested in soil health and is very knowledgeable about microbes and fungi in the soil. She will be a great resource to those producers who are interested in looking more in depth at their soils. Make sure to introduce yourself when you are in the office so that she can start to get to know our producers, landowners, contractors and other conservation partners.